Our Scarsdale Pest Control Exterminator will identify the source of the pest infestation and create a customized treatment plan to eliminate the pests. 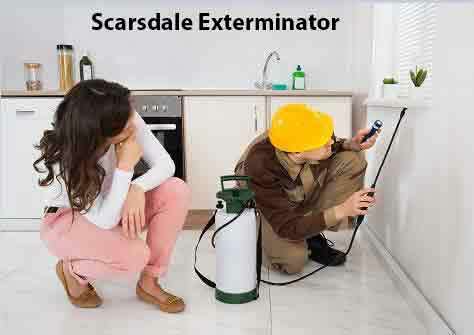 Let us be your Scarsdale Exterminator that you can Depend On, Give Us A Call Today. 1-844-305-8999. Have you found yourself a little too close for comfort with Raccoons in Scarsdale NY, if so you’re not alone. Not only are Raccoons a nuisance going through your garbage cans on a nightly basis they are also the number one carrier of Rabies. In the past few years there has been an increase of Raccoons with Distemper. Raccoons with distemper act disoriented and lethargic. They can become aggressive especially during daylight hours. If you have Raccoons on your property and would like them removed, Give Us A Call Today. We specialize in Raccoon Trapping and Removal. We humanely Trap Raccoons utilizing Havahart Traps. Bed Bugs have become a very common pest for the residents of Scarsdale NY. Research has indicated that one of the most effective tools for detecting low level bed bug infestations may be interception devices. Bed bugs feed for a period of 3 to 5 minutes, after which they are engorged and drop off the host. They crawl into a hiding place and remain there for several days digesting the meal. When hungry again, they emerge from the hiding place and search for a host. If you notice you have Bed Bugs or would like an inspection, Our Scarsdale Exterminator is only a phone call away. We offer Visual Bed Bug Inspections and K-9 Bed Bug Inspections. There are several kinds of carpet beetles that attack woolens. The most frequently encountered carpet beetle in Westchester County NY is the Black carpet beetle. Scarsdale NY homeowners frequently encounter the black beetles in their home. Carpet beetles destroy Furnishings and clothing made of wool, and of fur, feathers, or hair, and most other clothing you have in your closets. The feeding of carpet beetle larvae can be differentiated from the feeding of clothes moths by the fact that the beetles spin no webbing, a tell-tale sign of clothes moths. If you notice you have Carpet Beetles Give Our Scarsdale Exterminator a Call Today.